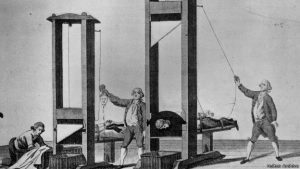 The sound of the guillotine that cut off the head of Louis XVI on January 21st, 1793 was heard yesterday all over France, loud and clear. 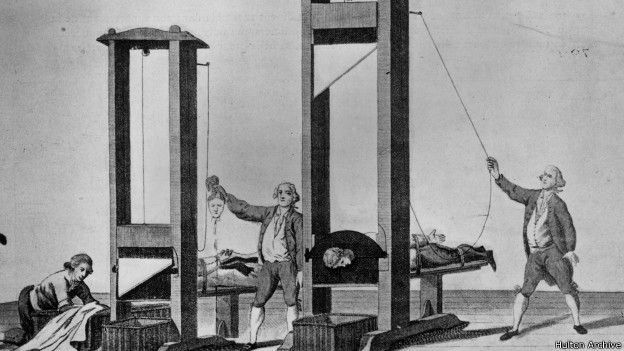 Louis XVI paid with his head (and those of his wife, Marie Antoinette and their two young children) for the sins committed by his grandfather, the Sun King, Louis XIV. And what may you ask were these sins, what made them so grave that they were visited in such horrific fashion not only on his grandson, but on all of France? Simply put: losing. Louis XIV was the sole beneficiary of a large European country that almost uniquely at that time was entirely united under him. Germany, Italy, and even England were still fragments of what they are today, but France was all there, in all its glory and riches. And what did the Sun King do with all of this cash? He established the French culture as we know it today, and it was dazzling. But he also fought many wars, all of which he lost. Lost was New France, an area in North America occupying most of today’s Canada, quite a bit of New England and most of the Upper Midwest, lost were France’s possessions in the Low Countries, now the French-speaking part of Belgium. Lost was the war for naval dominance against Britain. If there is one sin for which kings and potentates are never forgiven, it is losing. They are given much by their subjects, and forgiven much. But they have one task above all – winning. 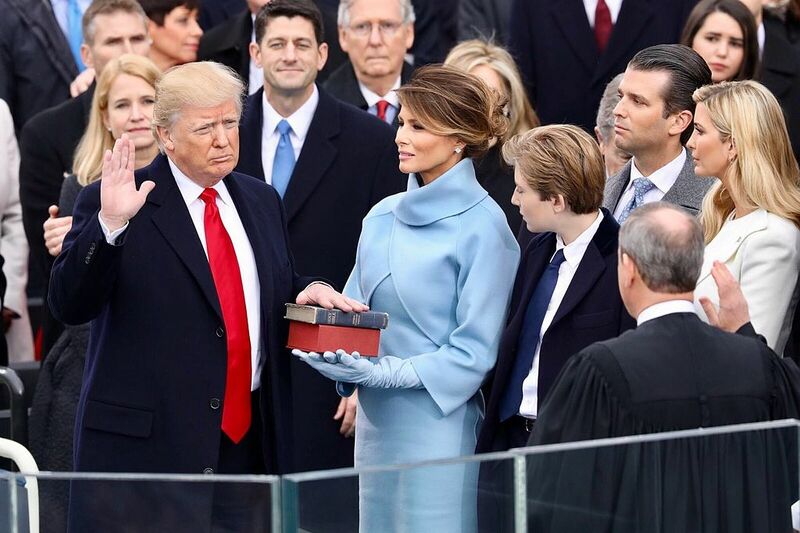 This is something that president Trump instinctively understands; winning is the entirety of his political branding. “Are you tired of winning yet?” is his trademarked line. I’m sure the oh-so-wise and oh-so-well-credentialed flunkies of the globalist regime in the US thought it was so corny that it would never work. Well, perhaps they should have paid better attention in history class. Stalin is still revered in Russia. Why? Because he won. The price doesn’t matter. Victory does. Uniquely. George Washington would have swung from a makeshift gallows in Richmond and all the Washington Streets in America would have been King Streets, had not Washington done one thing right – he won. Nicholas II of Russia was a dead emperor walking when he lost, in emphatic fashion, the Russo Japanese war of 1905. It took 13 more years for him and his family to be shot in that dank basement in Ekaterinburg, but he was already finished in 1905. In fact he had just celebrated the tri-centennial of the Romanov dynasty. In those three centuries, no Romanov had ever lost a major war (Crimean War of 1856 was fought to a draw against a leading power – Britain assisted by France and the Ottoman Empire). Losing in humiliating fashion was thus a Nicholas II innovation. It brought his dynasty and the Russian empire to a speedy and bloody end. In one sense, late 18th century France was a sun. Like many suns it went super-nova before finally burning out forever. Such was the arrival on the scene, in the immediate aftermath of that guillotine strike of one Napoleon Bonaparte. Napoleon was a winner. With his armies he conquered Europe, delivering major blows to the Austrians, the Prussians, the Italians, the British, and the Russians. In fact the 1805 Battle of Austerlitz, in which all of continental Europe was arraigned against Napoleon and lost, was the last military engagement of consequence that the French would ever win. Suffering a colossal defeat at the hands of Russian Tsar Alexander I in 1812 and a final defeat at the hands of Duke Wellington and an Anglo-Prussian coalition in 1815, Napoleon and France were branded with the parochial “L” high up on their cuirassier helmets. Since then France fought a disastrous war against Prussia in 1870 (in reality, Germany, as it was already almost unified), in which the French military was annihilated, Paris occupied and humiliating terms of surrender dictated. In 1914, WWI, French were ready for revenge. They put everything on the line. No matter how remote a French village is, at its center there is a cenotaph with incredibly many names of young men that left and never came back. And yet, France was soundly beaten yet again. Fighting alongside Britain and Russia (the latter to be replaced in 1917 by the US), it sustained massive losses and would have lost it all, but for the timely intervention of the US under Woodrow Wilson, who preferred not to have a German-dominated Europe. Within 20 years, in WWII, France surrendered to Germany after only token resistance, its capital once again captured, its military dismantled, its natural resources plundered. From 1870 to 1941, within the living memory of two generations, France fought three all out wars with Germany, losing all three in spectacular fashion. The battle for the dominance of the western part of continental Europe was fought and won – by Germany. The last vestiges of France as an independent polity resided with General De Gaul, whose very name is synonymous with the country he came to symbolize. A gifted tank commander, his tank corps was the only French force to offer any significant resistance to the invading Germans early in WWII. Needless to say this was a doomed effort, but it allowed him to be welcomed by Churchill in Britain and be put at the head of the French government in exile. Entering Paris in triumph in August 1944, De Gaul must have felt uneasy, since he knew better than anyone that Paris was liberated by the Americans who were ordered by Eisenhower to hang back and yield the glory to him. Still, France was welcomed, rightly or wrongly, into the winning coalition and all the trimmings that came with it. Nuclear status, a permanent seat on the UN Security Council. But the losing would soon resume. Fighting two colonial wars, trying his best to reestablish the French glory in arms, De Gaul bet and lost. France became bogged down in Algeria and in Indochina, fighting mid-19th century wars in the middle of the 20th century. It lost. 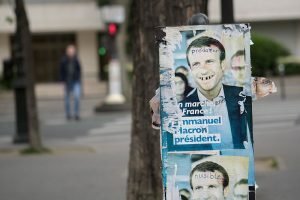 Today, with the sound defeat handed to the most Gaullist of all French presidential candidates since Charles de Gaul himself, Marine Le Pen, Germany has finally concluded its conquest of France that started in 1870. France today, as Mme. Le Pen has so often and so eloquently put it, has none of the marks of an independent polity. No control of fiscal policy or even its currency; no control of its borders or immigration, no control over internal or external trade or regulatory policies; no control over social fabric issues such as abortion, religion, LGBT, etc. ; no control over its judiciary or criminal legislation, and finally no control over its own military. Simply put, the French people are not sovereign in their fatherland. La Patrie is no more. So who is sovereign? That is not a difficult question to answer. Unelected bureaucrats from two separate bodies, both conveniently located in Brussels; NATO and the European Union. Both of these bodies are controlled by Germany, though when it comes to NATO, Trump’s administration is trying to assert the long-abandoned by his predecessors US leadership role. Trump may have to fight Frau Merkel on that one. If he does, he will fight to win. History has a skeleton. The skeleton is this: sovereignty is not a given. To have it, a people must be willing to fight and suffer tremendous losses. Nothing illustrates this better than current events; in 1870 and in 1914 – 1919 France suffered crushing defeats at the hands of the Germans. Defeats that destroyed its spirit and its willingness to pay the price of freedom. A hundred years later it finally and officially became the vassal state of its vanquisher – Germany with the full consent of its people. History has a funny way of making a point via counterpoint. Nothing can more antithetical to the soft globalist surrender of sovereignty that is today’s France than the muscular assertion of national sovereignty by the trifecta of the vilified old white males: Putin, Netanyahu, and of course, Trump. The brand identity associated with this trio can be summed up in one word: winning. 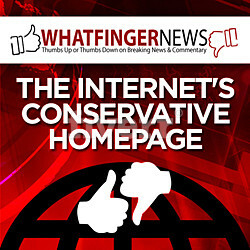 Simple unapologetic winning that is visible to the naked eye and does not require MSM pundits to explain it. It is visible via Tomahawk cruise missiles and the MOAB; the willingness to demolish all of Gaza to save one Jewish life, the sheer strength of will to flip off the entire planet by taking back the Crimean peninsula and forcefully entering the fray in Syria. It is visible via the unabashed championship of domestic industry and its products even at the exclusion of those made elsewhere, and finally it is visible via the setting of clear markers as to who can join your journey through history. You can join us, but only if you are Jewish, says the Jewish State. You can join us, but only if you love us and our way of life, says Trump. Our destiny is our own, you can share in it, on our terms. It is rare that one calendar month brings symbolic clarity as to the major historical trends of our times, but May, 2017 bears such a distinction. On May 1st, Israel celebrated its 69th Day of Independence. The most successful national liberation movement of all times, Zionism, celebrated the over-achievement of all of its founders’ dreams. Symbolically, the day before, Israel united in memory with over twenty four thousand Jews that laid their lives to achieve this goal. Israel’s victory is the victory of a nation, a cohesive ethnic and cultural unit that for a century and a half now is willing to pay any price for its sovereignty and freedom. May 7th, only a week later, brought us in stark contrast, the unconditional surrender of sovereignty by two thirds of the French people. France as a political entity is no more. 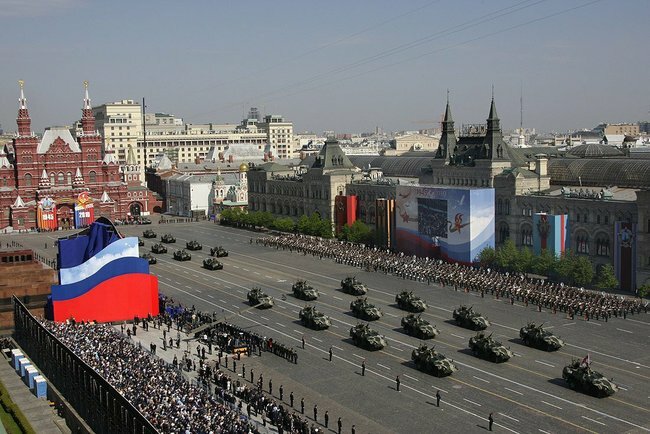 Finally, May 9th will see the traditional Victory Day parade in the Red Square. 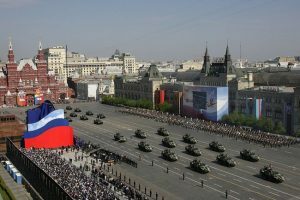 It is not a coincidence that it will be one of the biggest displays of Russian military might in history. Nor is it a coincidence that Russian media is full of pictures and films documenting the utter destruction of German sovereignty that was visited on Nazi Germany by the Russians seventy two years ago. Peoples who want to remain sovereign and are willing to pay the price choose leaders who win, peoples who don’t choose Emanuele Macron.